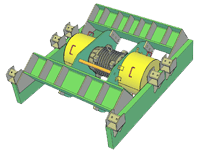 Variant Mining Technologies’ innovative Vibratory Feeders are designed to transport and redirect muck in underground circuits. Built to the highest engineering standards, they can be incorporated into your existing systems or coupled with Variant Mining Technologies’ industry-leading chutes.Each Vibratory Feeder is custom-built to meet our customers’ individual requirements. Our Feeders are completely cageable and specifically designed for easy installation. They can be pneumatically or hydraulically driven, according to your needs.Maximum DurabilityVariant Mining Technologies Vibratory Feeders are designed to withstand the most extreme conditions. With wearpoints reinforced with 400BHN or 500BHN hardened steel liners, our Vibratory Feeders are built to last.